-- VP of People at Amplitude, the fast-scaling purveyor of product analytics for the digital era -- certainly fit that bill. Dialling in from San Francisco, Lisa schooled us on a variety of topics - from why HR is about to be disrupted, to why you can't just buy training, and why HR needs to take itself more seriously. 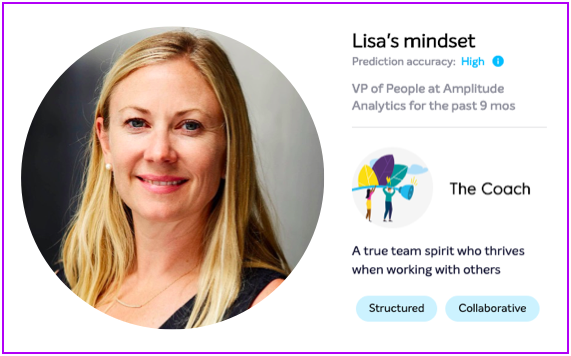 Lisa Nielsen, VP People of People at Amplitude Analytics. Mindset analysis from Emma by Bunch.ai. CULTURED: Can you tell me a little bit about your role as VP People? LN: When I joined in July, Amplitude was 160 people. It’s wild that the company has almost doubled less than a year after I joined and we have no plans to slow down. My job is to support that growth. We’re bringing in a lot of training and coaching programs, especially for managers. I am very focused on culture and behaviors. It was very important to me to find a CEO that understands the relationship between culture and performance and that creating culture isn’t about sticking some values on the wall. You need to be intentional about inputs into culture, organizational habits, and the importance of designing high-performing teams. I’ve been lucky to find that in Spenser. He gives me the air cover I need to go do measurement that needs to be done, to mandate the programs and initiatives I need to be established, hold managers accountability to high performance as a manager, and make People initiatives a priority. CULTURED: What role do analytics play in your job? LN: We’re very focused right now onboarding, training, and developing our managers because of our growth, so we have upward manager feedback that we use to measure performance. We track this number to measure the effectiveness of our manager enablement programs. We also measure things like adoption rates on coaching and L&D programs, engagement, attrition, ratios, and standard recruiting metrics like conversation rate, acceptance rates, source ratios, etc. CULTURED: What’s the key to an effective training or coaching program? LN: I think it starts with having a clear idea of what makes a good manager in our context. We identified what that meant for Amplitude, and ended up with something not dissimilar to Google’s famous 8 characteristics of great managers. Good trainings always start by thinking through what behaviors you are trying to affect. The mistake most people make is thinking they can just buy training. But it just doesn’t work like that. Great managers tend to do the same things, but there’s nuance in how they do it. They need to do things slightly differently depending on the context of their organization. Also, training needs reinforcement to make changes stick, which is hard when your training was out of a box. It needs to be congruent with the other programs, integrated into your performance management. CULTURED: You’re passionate about organizational development. What is it that you love about it? LN: I love looking at systems as a whole. Seeing people, processes and tech in action. Every action has a reaction, and I find that fascinating. I also think we a lot more intelligence within organizations than we currently harness. OD has a lot of methods to access that intelligence. CULTURED: How has HR changed in recent years, and where do you think it’s headed? LN: I think there is a huge change coming in HR. We’ve seen automation, technology, and data completely change other functions. It started with sales, then it was marketing, then product (thanks partly to companies like Amplitude), and now we’re really just waiting for a leader to come along and turn HR on its head. CULTURED: There already have been lots of advances in HR tech, how come that “flip” hasn’t happened yet? LN: Because HR tech today is still designed around “best practices” that haven’t been evaluated in awhile. If you look concepts like performance reviews and the way we deliver feedback - HR tech has given us a better UI, ad real time ad hoc access but it’s still a crappy experience. They’re fundamentally broken processes being made slightly less painful. CULTURED: What do you think the trigger will be that changes everything? LN: It’s going to be related to access to behavioral data. There are a lot of interesting things going on already like the causal inference stuff that hasn’t gone mainstream. For example, there’s a tool that tracks how many messages are sent within a functional team vs. outside of that team. Data like this gives us an opportunity to think about the root cause of problems, and often it’s going to tell us the same thing that great HR leaders already believe to be true, but the application of “best practices” don’t capture. CULTURED: What’s the most broken part? LN: Feedback. Don’t get me wrong, feedback is essential, but we wring out nearly all of its usefulness though the processes we use. At its root, the most fundamentally valuable feedback is in 1:1, face-to-face dialogue. When we take that away, it loses value, because you don’t get the opportunity to ask questions, ask for clarification or context - there’s no dialogue. So what happens? People read feedback once a year, or once a quarter, try to make sense of it, feel bad or feel good and that’s it. CULTURED: What advice do you have for your fellow practitioners in HR and people operations? LN: I think HR needs to take itself more seriously! I think as a field, we went through a phase where everyone tried hard to quantify the ROI of HR but never really succeeded, so we gave up. We decided to accept being wishy-washy about the work that we do and why we do it. Look at culture for example. We’ve allowed culture to be viewed as this nebulous thing. We’ve not been firm enough in defining the behaviors we need to reinforce, or what kind of education we need to give our team in order to drive cultural outcomes. We need to be willing to put a stake in the ground and say “here’s what we need to do”, and “here are the trade-offs” that need to be made. For example, some people say “you can’t mandate specific training programs” - I say bullsh*t! If you want a certain culture you need to mandate certain things. Thanks for checking out our Expert Series! We publish new interviews regularly with People leaders from Fortune 500 companies, hyper-growth startups, and everything in-between. To stay in the loop, subscribe to our email newsletter here: Beyond the obvious: Hacks for high-performance leaders and teams.